Discussion in 'Misc. Films' started by Spider-Who?, Feb 8, 2006.
has anyone heard of this movie? Its in post produciton now, and yes, the title says it all. oh, and Sam Jackson is in it. No, I haven't seen it. But I can say this. "There are mother ****in' snakes on this plane!" Yea,wierd title wierd movie... might be good to check out,lol. not sure, They released a picture of the snakes,it was funny. From what I understand, there is a person on the plane who is going to testify againts a major mob boss. The mob boss has sent an assasin to deal with the witness. The assasin's specialty? He has a bag full of snakes. Which he throws at people. Samuel L. Jackson is the pilot. Crappy action movie insues. This will probably be Keenan's best movie since Goodburger! Oh, and Sam Jackson is not the pilot, but the FBI agent protecting the whitness. But apparently the pilots are the first one to die. Plot Outline: On board a flight over the Pacific Ocean, an assassin, bent on killing a passenger who's a witness in protective custody, let loose a crate full of deadly snakes. The director of this movie did Cellular, an EXTREMELY underrated flick in my opinion. snakes on a plane. best... title... ever!! motherf***ing snakes on a motherf***ing plane. that's all you need to know. Check it out!I have the very first print ad,written by Frank Miller! This looks like the greatest movie of all time. HA!! 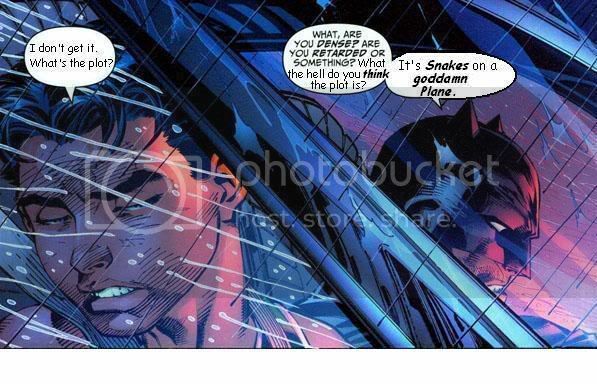 best usage of "the goddamn Batman" so far! Holy **** that is one of the worst plots I've ever heard. I have to see it. are you kidding me?! motherf***ing snakes on a motherf***ing plane!! it's GENIUS!!! It's a fairly original idea, I'll give it that. I want to see it to find out how it all plays out (even though I'm pretty sure I already know how it all plays out) and because badass mother****er Samuel L. Jackson is in it. It's still a WTF? plot...almost a plot that would be in an action film parody. ya the best thing about this movie is you know EXACTLY what your getting. some of these recent movies has very deceiving titles. This better be a dark comedy like "Eight heads in a duffelbag",otherwise I'm just going to LMAO due to the sheer stupidity of the plot. Keanan Thompson?It would justify the existence of this film just to hear him say "What?You telling me there are snakes on this plane? *squints eyes*WHYYYYYY?!". The only thing that would top that is if Kel suddenly walked out,threw his arms around and said "Awwww,here it goes! ".